The Annual Trunk-or-Treat and Halloween Spooktacular will be held on Friday, October 19 from 6:30pm – 8:30pm at the Drum Point Sports Complex. 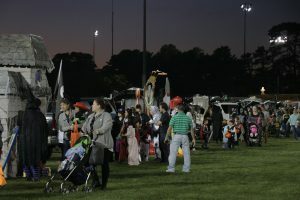 Residents and businesses will bring their vehicles, decorate them and hand out treats to Brick Township’s young witches, goblins and Fortnite stars! In addition, there will be a costume parade with prizes awarded to top costumes, a hay ride and much more. This event is free to attend. Costumes are required to trunk-or-treat. Anyone wishing to decorate a vehicle and hand out treats is welcome and asked to call 732-262-1073 to register. You can also register your car online at parksandrecreation.bricktownship.net. We kindly encourage anyone attending to bring a bag of candy to donate to vehicles to ensure that all kids go home with a bag of treats. Please note: the rain date for this event is October 26.